1. Preheat the oven to 200°C, gas mark 6. Place the squash in a large roasting tin and toss with the rapeseed oil and sage leaves. Roast for 25 minutes until very tender. Mash or blitz in a food processor until smooth. Transfer to a bowl and mix in the ricotta, half the pine nuts and half the pecorino. Set aside. 2. Wash the spinach well and place in a large saucepan. Cook until completely wilted then leave to cool. Using your hands, squeeze out any excess liquid then chop roughly and set aside. 3. Brush a large baking dish or roasting tin with half the butter. 4. Cut the lasagne sheets in half to give rough squares. Cook them, in batches, in a pan of boiling water for 1 minute. Remove from the pan with a slotted spoon or tongs and lay them out on a clean tea towel. To assemble the cannelloni, start by spreading a spoonful of squash mixture across the centre of each pasta sheet and top with a little chopped spinach. Roll up and place seam-side down in the baking dish or tin. 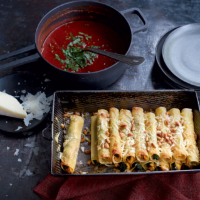 Repeat with the remaining filling and pasta — you should end up with 20 filled cannelloni. 5. Brush with the remaining melted butter and sprinkle over the rest of the pecorino and pine nuts. Cover with foil and bake for 10 minutes, then remove the foil and bake for a further 10 minutes until golden and slightly crispy at the edges. 6. For the sauce, heat the olive oil in a saucepan and add the chilli and garlic. Cook for 30 seconds until pale golden then add the passata and balsamic. Simmer for 10–15 minutes then stir in the basil. Serve the cannelloni with the sauce, and extra pecorino if you wish. Try using a pack of Waitrose Butternut Squash Wedges or Diced Butternut & Sweet Potato in place of the whole butternut.